Matsuyama, 24, is coming off a successful sophomore campaign on the PGA TOUR. He recorded career bests in top-10 finishes (9 in 25 starts), earnings ($3,758,619), and in FedExCup standings (No. 16). He has continued to play well this season, recording five top-10 finishes over 13 events, including his second career PGA TOUR title at the Waste Management Phoenix Open and a T-7 finish at the Masters Tournament, his second consecutive top-10 finish at Augusta. Matsuyama is ranked No. 14 in the world and stands No. 9 in FedExCup points and No. 6 on the PGA TOUR money list with $2,860,135. Competing in his first Presidents Cup in 2013 at Muirfield Village Golf Club, he went 1-3-1 for the International team. In 2014, the Sendai, Japan, native became the youngest player to win the Memorial and the first since Roger Maltbie, who won the inaugural event in 1976, to record a victory in his first start at Muirfield Village Golf Club. He finished T5 in defense of his title last year to bring his Tournament earnings to $1,342,300 and his scoring average over eight rounds to 68.88. Memorial Tournament veteran and 2002 winner Furyk will be teeing it up for the 21st time at the 2016 installment of the Memorial. Furyk has career earnings at the Memorial totaling $2,760,438.24, and a 70.90 scoring average, placing him third in both categories in Tournament history. His T-5 finish in 2015 marked his 19th made cut at Muirfield Village Golf Club and seventh top-10 finishes. A resident of Ponte Vedra Beach, Fla., Furyk, 46, has recorded 17 TOUR wins and is currently ranked No. 25 in the world. 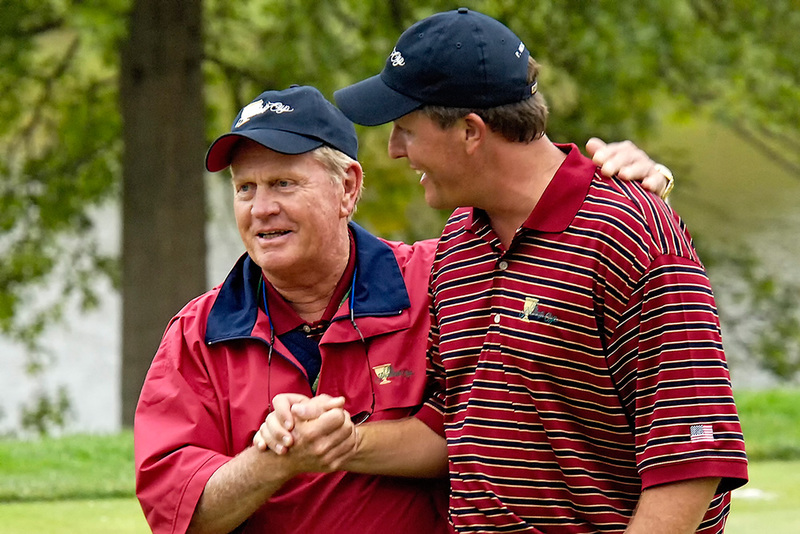 The 2003 U.S. Open champion has been a member of seven U.S. Presidents Cup teams and nine U.S. Ryder Cup teams. Furyk is fourth all time in PGA TOUR career earnings with $65,644,297. Mickelson, Matsuyama and Furyk further strengthen a field at the 2016 Memorial Tournament presented by Nationwide that boasts five of the top-10 players in the world, including No. 1 Jason Day, No. 2 Jordan Spieth and No. 3 Rory McIlroy. Day is coming off a wire-to-wire victory at last week’s THE PLAYERS Championship and is the reigning PGA Championship winner. Spieth is the reigning U.S. Open champion and McIlroy a four-time major championship winner. In other Tournament news, a limited number of badges for the Golden Bear Club are available as the popular venue approaches a sell out for a third consecutive year. The upgraded badge provides access to a menu of items for purchase catered by Cameron Mitchell Premier Events, a cash bar, television viewing, private restrooms, scoring terminals and open seating in a sports bar atmosphere. The Golden Bear Club is located within the Patron Village in the heart of Tournament play between Hole No. 10 fairway and No. 14 green. Patron Village includes an area that is open to the public featuring upgraded food and beverage options, open patio seating and more. The public may call the Tournament Ticket Office 9 a.m.-5 p.m. weekdays at 877-MT BADGE (877-682-2343) or visit www.memorialbadges.com to purchase badges. Kids 16 and under can attend for free with a ticketed adult and kids 18 and under are admitted free on Wednesday, June 1, for Junior Golf Day. Daily practice round tickets for Monday, Tuesday and Wednesday are also available. The cost is $35 and they are valid for all three practice-round days.